VISALIA – What makes a hero? Not every superhero wears a mask. Many of them don’t wear capes. Some have superhuman powers, some don’t. So is it their overwhelming sense of responsibility to help their fellow man, or their extralegal sense of justice? Or perhaps, it’s all of the above but with a rousing theme song that inspires us to take action! That’s the premise of the Sequoia Symphony’s next concert Great Movies/Great Music: Marvel-ous Heroes! The symphony’s annual nod to cinematic scores will feature well-known themes from such films as “Superman,” “The Incredibles,” “Batman,” “The Avengers” and many others. These themes were created by some of the Hollywood’s most acclaimed composers including John Williams, Danny Elfman, Alan Silvestri, and Michael Giacchino. Williams set the stage for blockbuster superhero soundtracks with the theme for Superman (1978) starring Christopher Reeve. The genre took on a new fervor with Elfman’s Batman (1989) theme before Alan Silvestri solidified the Marvel Studios cinematic universe with Captain America (2011) and the Avengers (2012). Giacchino helped introduce an original superhero family to the big screen in The Incredibles (2004) before being brought into Marvel with Spider-Man Homecoming (2017). Batman, Wonder Woman and other super heroes will be on hand when the Sequoia Symphony performs exciting movie themes of super hero films at 7:30 p.m. on Saturday, March 2 at the Visalia Fox Theatre. Tickets range from $22 to $45. Before the concert, those attending the Red Carpet reception can have their pictures taken with Spiderman, Captain America and characters from “Star Wars” from 5:30 to 6:30 p.m. The reception includes wine, hors d’oeuvres, a silent auction and drawings. Fresno Lexus will have their latest model on display. Those portraying the “Star Wars” characters are part of the Central California Garrison of the 501st Legion Star Wars group that creates their own authentic costumes and makes appearances and raises money for a variety of charities. 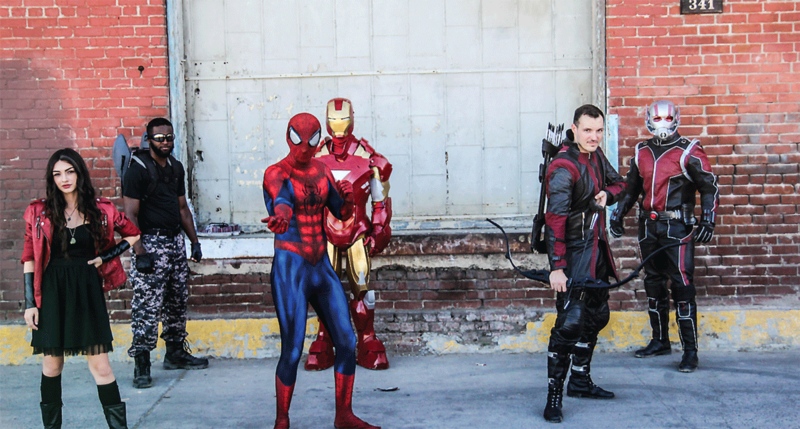 The super heroes are part of Hero Alliance, a group of actors in costumes replicated from the movies. The audience is invited to attend the pre-concert preview by music director Bruce Kiesling at 6:45 p.m.
Tickets for the Red Carpet reception are $35. Tickets for both the concert and Red Carpet reception are available at the symphony office, 208 W. Main Street, Suite D, Visalia, downstairs in Montgomery Square. Tickets are also available at 732-8600 or go to www.sequoiasymphonyorchestra.com.